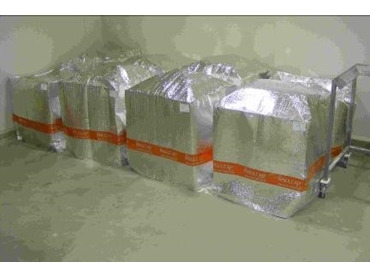 Tojo Packaging introduces Insulcap, a highly efficient, cost effective and versatile insulation material used to protect temperature sensitive products during transport and shipping. Insulcap insulation products work by harnessing the power of the air by reflecting damaging and harmful solar rays. This insulation material is made up of a 5 layer thermal wall that combine to provide remarkable temperature control properties. The insulation properties of the Insulcap products work equally well to keep cold products in a warm truck cold, or room temperature products in a refrigerated truck at room temperature. Thanks to Insulcap Pallet Insulator, products that require different temperatures can be conveniently shipped side by side. This will cut fuel costs drastically by reducing or even eliminating the need for refrigeration during transport of produce.